The framework for building a more just economic order for the world, with the help of Catholic social teaching, might have begun to be constructed at the University of Pennsylvania on Friday, May 23. The Collegium Institute for Catholic Thought and Culture held a lunchtime program focused on Catholic social thought, economics and social justice. The year-old institute is, according to its mission statement, an independent scholarly foundation devoted to fostering the Catholic intellectual tradition at Penn. The forum plugged into the tenured minds of current economic research thinkers Dr. Jesus Fernandez-Villaverde, senior fellow of the institute and professor of economics at Penn, and Dr. Matthew O’Brien, chairman of the institute’s board and a philosophy teacher before becoming an equity research analyst. The anxiety of many people who believe they are being excluded from the benefits of the global economy can lead to bitter feelings and anger, according to Fernandez-Villaverde. “There is a sort of a winter of discontent among Americans, and a lot of room for improvement,” he said. Fernandez-Villaverde talked at length about education, its increasing necessity for enjoying the benefits of the economy and the need for adaptability in students: “The classics are still important,” he said. “We focus on mathematics because it is something we can measure … but balanced education adds in the classics. The conversation regarding investments and income economics held many a hot-button topic, and the questions from the audience focused on nostalgic traditions from the past competing with current trends and future hopes. “Focusing solely on income issues distracts from other issues,” O’Brien responded. “Human action and behavior is presumed. Economic and financial policies (currently) are fundamentally manipulative. (Institutions) are not engaging individuals who can then respond and build on that. “Ownership and responsibility,” he continued, “through investing and index investing, is it in violation of Catholic social teaching? It’s the kind of “On the Waterfront” discussion,” he said, referring to the movie depicting a mid-20th century Catholic understanding of the role of labor unions, the role of capital and the responsibilities of economic and social systems to the individual. The discussion also touched upon issues such as the movement regarding pro-market thinkers versus pro-business thinkers. 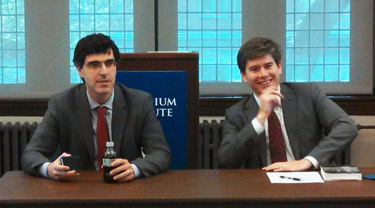 Fernandez-Villaverde used the example of computer software to frame the debate. Open-source software is developed by programmers to be shared and improved upon by all users on the Internet, while software giant Microsoft Corp., for example, tries to patent software as its intellectual property. “For a market economy to succeed, it is important for people to agree it’s fair, and not crony capitalism,” he said. He added that when a business, legitimately or not, is accused of “twisting the system to protect its intellectual property rights, people become unhappy,” and they may “misdirect their anger” toward Congress seeking legislative solutions. He pointed toward the online, volunteer-driven, free encyclopedia Wikipedia as “an example of subsidiarity” that is “better than anything centrally planned.” That principle of smaller, locally oriented organizations doing as much as possible is firmly rooted in Catholic social thought. As the intellectual symposium came to a close, discussions continued to buzz like electricity in the air around the Ben Franklin Room on the Penn campus. Marimah Branch is a freelance writer in North Wales.